Call me basic, but I love fall. So you can imagine my heartbreak that it’s still 80 degrees in the south and there’s not a single leaf changing colors in sight. Le sigh, we can’t have it all can we? But just because it’s not fall in the south doesn’t mean it’s not fall in this house of mine. Because you bet your bottom dollar I’ve had fall decorations up since the end of September and sweating in my fall clothes to get my fix. 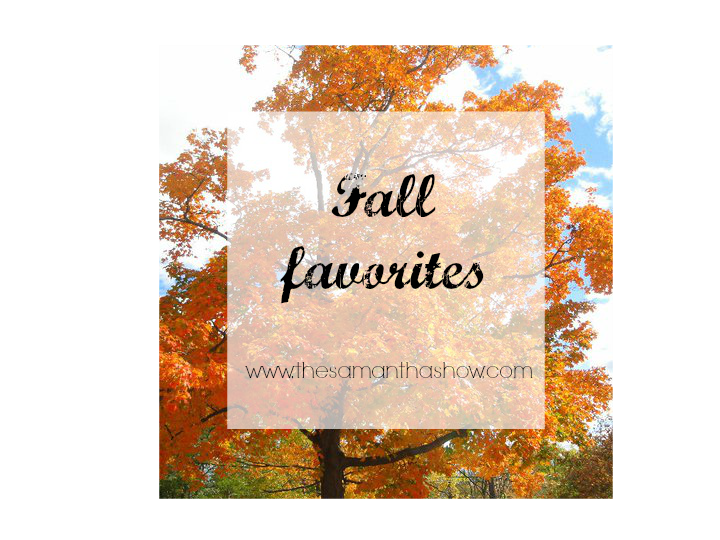 Whitney from The Whitney Story tagged me in a fall favorites post, so today I’m talking all about my fall favorites! Favorite Candle– right now I’m burning Yankee Candle Apple Pumpkin. But I’m a huge fan of all the Bath and Body Works ones. I burned through those in the first weekend. Time to restock! Favorite Lip Color– I originally had one here but I changed my mind… I have three I currently alternate between; Rimmel London Berry Rose and Maybelline Blissful Berry and Mauve Mania. Girl can never have enough lipsticks. Favorite Drink- I may be basic but I am NOT a Pumpkin Spice Latte kind of girl. My fall drink is a Nonfat Chai Tea Latte. Or I stick with my year round drink, Caramel Macchiato and just get it hot instead of cold. Favorite Blush-I’ve been using a Master Hi-Light from Maybelline. I just started using blush last year and it was my MAC one in Blushbaby. That’s probably a good year round blush too. Favorite Clothing Item-That’s a toss up… I would say either fringe boots/booties or my blanket scarf. Favorite Fall TV Show– American Horror Story or The Blacklist. We’re also watching The Walking Dead on Netflix and are currently on season two. We have a long way to go but who doesn’t love a good Netflix binge? Favorite Thanksgiving Food– Stuffing and gravy… I randomly made some a few weeks ago and I can’t wait to make Thanksgiving dinner here for the first time EVER. Let’s hope it’s edible. So there you have it! I’m going to tag Hallie from Life: Oceanside and Keating from High Heels and Combat Boots. Enjoy ladies! Now tell me YOUR favorite fall goodies! « Play all day with Playskool Sesame Street Play All Day Elmo.